Jamie (Oliver) says that this stuffing is “dynamite” with turkey, but it is also a winner with roast chicken any day of the week. However, I found it very reminiscent of past Christmas Eves when we always had homemade sage and onion stuffing on the go in our house together with a sausagemeat stuffing. This recipe combines the best of both and by using gluten-free breadcrumbs, it is perfect for my gluten intolerant husband. The aroma whilst making it was heaven. The main problem being that I was making it a day in advance, so I had to wait to try it out! Peel and finely chop the onions and pop into a large non-stick pan with a good lug of olive oil. Saute for 5 to 10 minutes until they are softened but not coloured. Peel and chop the parsnips; chop the sage and add these to the pan together with the cider and a good pinch of sea salt and black pepper. Place a lid on the pan and leave for ten minutes to soften the parsnips stirring occasionally. Peel and chop the apple then add it to the pan once the parsnips are softened. Cook for a few minutes then put the mixture into a large bowl and leave to cool completely. Once cool, skin the sausages and add the meat to the mix, together with the breadcrumbs. Finely grate the lemon zest into the bowl and add the egg. Use your hands to squeeze the mixture together until it is well mixed. Press into a greased dish/tin – cover with foil and bake for 45 minutes at 190°C. Remove the foil and cook for a further 15 minutes. 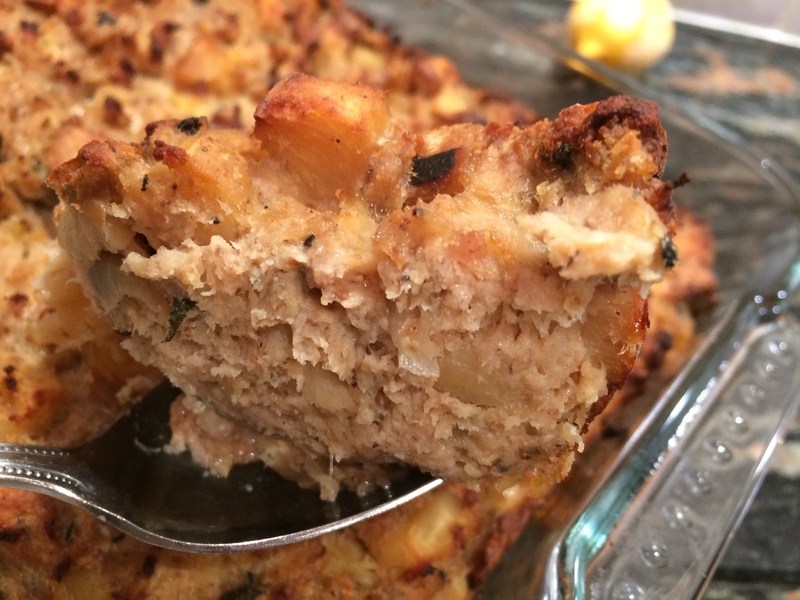 Update: I served the stuffing with roast chicken and it was really tasty; sausagemeat, apple with only a hint of parsnip. Highly recommended. 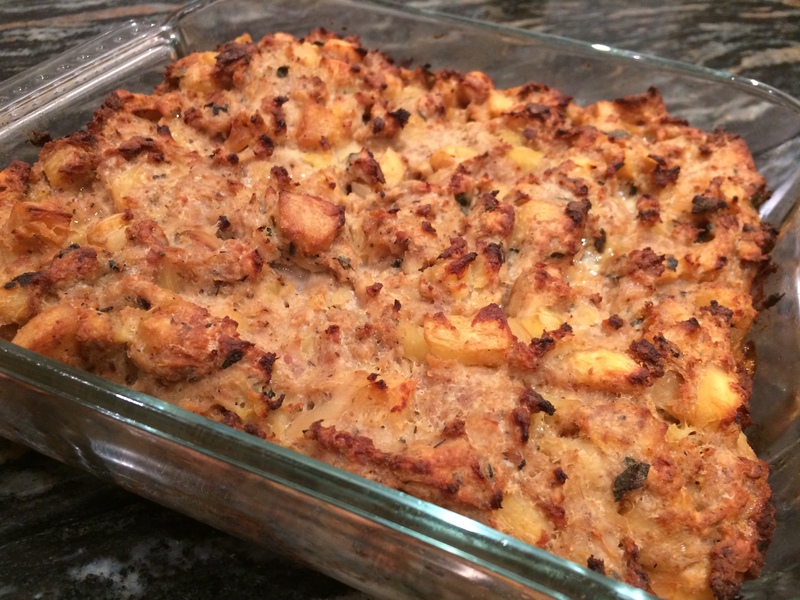 This entry was posted in Dinner, Miscellany and tagged Apple, Dinner, Gluten Free, Healthy Eating, Parsnip, Pork, Sausagemeat, Stuffing, Wheat-Free. Bookmark the permalink.